"You are buyers for different merchant houses in the competitive, but profitable age of the infamous Medici family. Ships sail throughout the Mediterranean and beyond in search of rare and valuable merchandise and profitable markets for the goods you buy. Every day you go to the wholesale market where you must compete with other buyers for the merchandise available that day. There you expect to find fur from trappers in the north, grain from the rich fields to the north and east, exotic spices from strange lands far to the east, dyes from near and far depending on the colors, cloth from the many nearby factories, and, rarely, gold from mines whose locations are kept secret. Goods at the wholesale markets arrive early in the morning to be sold in lots, registered as they arrive. The lots are sold at auction in the order received, but are offered in groups of one, two, or three lots. By custom, the groups are chosen by the buyers themselves, with each taking turns picking lots until all available goods are gone. Each lot is assigned a fair value, but successful buyers will find ways to buy expensive goods cheaply and sell cheap goods for large profits. To speed the process and encourage higher prices, each buyer is allowed just one bid on each group with the buyer who chose the group getting the last bid. If no buyer bids on a group, the unwanted lots are tossed into the harbor. As the lots are purchased they are immediately loaded onto the waiting ships so that the ships may depart as soon as the market closes and the tide is high. Buyers filling their ships early sometimes use the free time to visit friends or one of the many nearby taverns. More often, however, they stay to watch and learn from their competitors. When only one buyer remains, the market is closed and the remaining lots, if any, are loaded onto that buyer's ship without cost, as there is no more competition. If the last buyer does not have room for all remaining lots, the extras are thrown into the harbor. Thus, the market is empty and ready for tomorrow's goods. As the ships set sail to deliver their merchandise to foreign ports, the buyers gather to calculate their earnings for the day. A buyer's earnings are based on the total value of the goods he bought and the number of each commodity compared to the other buyers. This is also the time for those who have made great deals to brag and for the others to congratulate them, but to remind them that tomorrow will offer different opportunities for all. Later, the buyers will begin planning for the new day: should they try again to buy only the best and most expensive goods or look for deals in one or two commodities to corner the market in those goods. Both strategies offer the possibility of profit and success, but only when the rewards exceed the money spent to reap them. "The players take on the roles of the heads of influential families in Paris at the end of the 14th century. 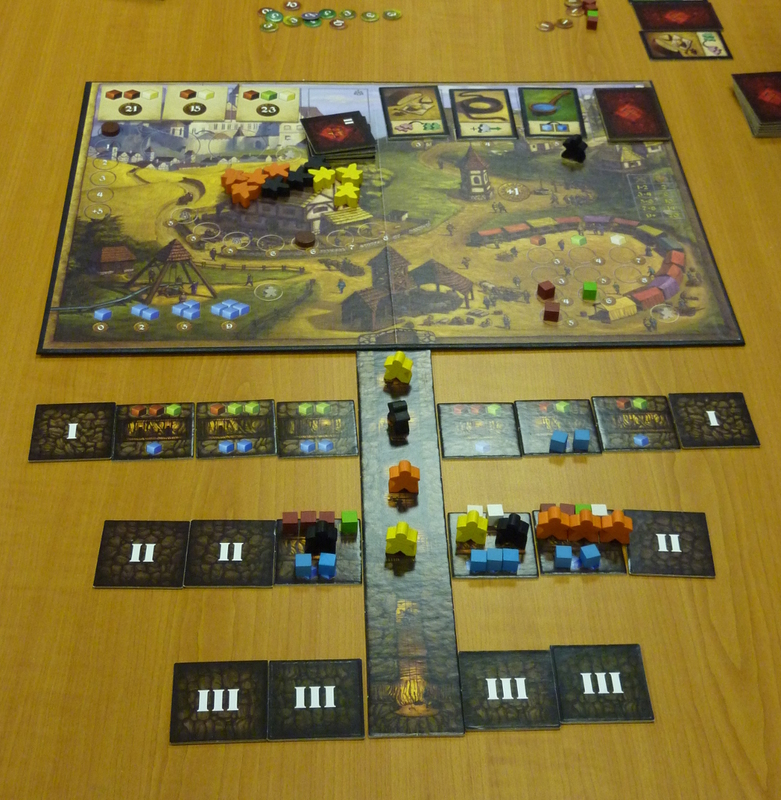 In the shadow of Notre Dame cathedral, the players compete for prosperity and reputation. Each family controls one of the 3-5 boroughs that surround the site of Notre Dame. As head of his family, each player tries through clever use of his action cards, to advance the power and prestige of his family. When he plays an action card, he can add in specific sectors of his borough. When he chooses to add to his influence with the bank, he increases his access to money or when he turns his attentions to the residence, his prestige grows directly as a result. Of course, each player must make his own choices to try to gain prestige in his own was. In each roun, the players also have the opportunity to hire the services of one of several persons to enhance their prestige or position. On some rare occasions, the best choice is obvious, but often it is not. A successful player will find the right moments to make the best use of his cards and the persons for hire." - Rio Grande English rules. Each player has a personal board and deck of action cards. On each turn 3 cards are drawn and rge player selects one, passing the remainder to the player on his left, the players then select one from those passed to them and pass on the remaining card so each player ends of with 1 card from each of three players. Following this card selction each player had 2 turns in which they play cards, leaving one unplayed. The cards allow actions, such as the placement of influence cubes on the player's board, which have various effects. Following card play, people are hired with various effects and then there is a check for plague, which may cause losses of influence for those who have not done sufficient work to control the rats in their borough. AFter 9 rounds the player who has accumulated the most prestige (Victory Points) is the winner.